This week we have another delicious recipe by the very talented Petite Kitchen. If you have been looking for a healthy alternative to muffins then this recipe is perfect. This is a recipe for gluten free, grain free, refined sugar free and dairy free white chocolate and raspberry muffins. The muffins are sweetened with cacao butter, I will give you a little insight into what this beautiful ingredient is if you don't already know. Cacao butter adds a chocolatey bite to these muffins without all the excess sweetness from refined sugar. The purest chocolate comes from organic food grade cacao butter. Cacao butter has great medicinal value in treating and protecting us from various ailments and can even be used on the skin as a moisturiser. Cacao butter is the pale yellow, edible natural vegetable fat of the cacao bean. Cacao butter is extracted from the cacao beans and can be used to make chocolate, it is made by pressing ground, milled cacao nibs to make a cocoa paste. Raw or organic cocoa butter is made from 100% pure cacao oil. This butter possess a rich, delicious chocolate aroma making it a great alternative to un-organic butter, chocolate and refined sugar. Cacao butter is high is good quality fats, 61% of the fats are safe saturated fats that will not oxidize easily, 35% are mono-saturated fats which are the same types of fats found in avocados, nuts and seeds and olives, and the last 4% of the fats are the easily damaged polyunsaturated kind. This makes cacao butter an excellent food to cook with as it is heat stable and it contains natural anti oxidants that prevent it from going rancid. Any oils or fats that are destroyed under heat will cause inflammation and stress in the body, which is why it is so important to be using the right kind of cooking oils and fats. 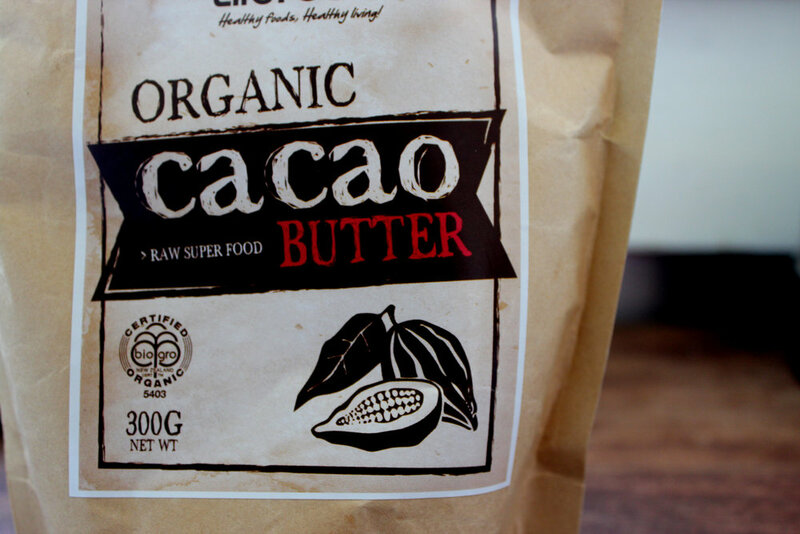 Cacao butter is high in antioxidants which help protect the cells against free radicals. Free radicals destroy cells, including skin cells. As they begin to do their damage on your skin, your skin cells quickly begin to age. Cacao butter is high in vitamin E which is a powerful antioxidant, it also contains vitamin A and C.
You can add cacao butter to smoothies, desserts and sweet tasting recipes. It can be mixed with massage oil and applied all over the body, some benefits include softer, smoother skin, reduction of stretch marks and helps in treatment of skin conditions such as eczema and dermatitis. This will leave you smelling like white chocolate. These gluten free almond muffins are naturally sweetened with honey and have a divine white chocolate after taste from the cocoa butter. They have an incredible moist, yet light and fluffy texture, with bursts of sweet delicious raspberries with each bite. Preheat the oven to 160°C, and line muffin tins with baking paper or muffin cases. In a large mixing bowl, add the almonds, eggs, cacao butter, honey and baking soda. Using a wooden spoon, mix until very well combined. Lastly, fold in the berries. Spoon in to the prepared muffin tins, then sprinkle with the silvered almonds. Bake in the oven for 20-30 minutes or until a skewer comes out clean when inserted.